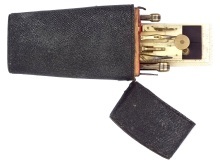 An Otis King's Patent Calculator, model K, stamped on the bottom Made in England Y4198. The calculator is complete with its original instruction leaflet and original numbered cardboard box. Inside the box is a laminated card insert showing the decimal parts of £1 (the £1 shown in shillings and pence) and the decimal equivalents of parts of an inch (the inch shown as 1/64 - 63/64. The barometer is signed on the silvered register plate Ramsden London. 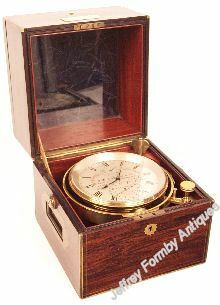 A good 2-day marine chronometer in its original mahogany box, signed on the silvered dial Thomas Mercer Ltd St. Albans, England. 16442, and engraved with the Admiralty 'broad arrow'. The underside of the bowl is engraved with a broad arrow and HS1 indicating that the chronometer was in British Government service. 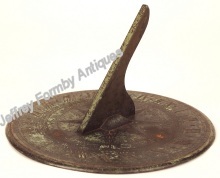 A boxwood pocket sundial signed on the compass dial paper Negretti & Zambra, London. Dials of this type are known as diptych dials. This dial dates from the second half of the 19th century. A George III, 12 inches diameter, bronze horizontal sundial engraved with the maker's name T Blunt Cornhilll, London. 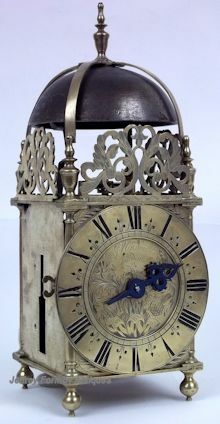 A good brass lantern clock, by a well respected late 17th century London maker, signed on the engraved dial centre J Windmills London. 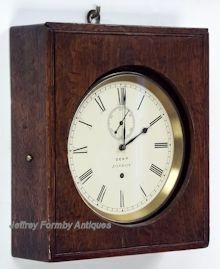 This clock is a rare example of a verge escapement with the pendulum swinging between the trains and has never been converted to anchor escapement and long pendulum. A ship's bulkhead timepiece complete with its original oak case and original winding key, signed on the white painted dial Dent London. The oak case has a sliding front panel and measures 8¼ inches wide x 9½ inches high x 2½ inches deep. A good English single train skeleton clock with passing strike mounted on its original, brass inlaid, ebonised base complete with glass dome. 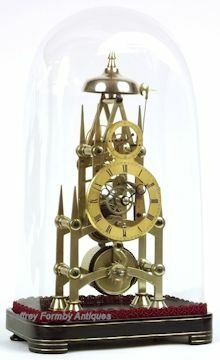 Height, including glass dome, 17¾ inches. 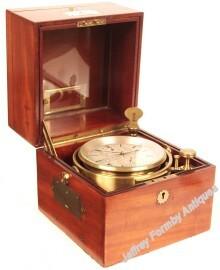 A small 2-day marine chronometer in its original mahogany 3-tier box signed on the 3¾-inch silvered dial Litherland Davies & Co,, Liverpool 488/13856. The chronometer has a helical blued steel balance spring and an Earnshaw type balance. 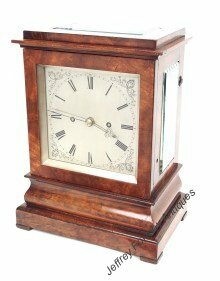 A good mahogany 4-glass mantel clock signed on the movement backplate John & Robert Barker 17 Aldgate High Street 1791. 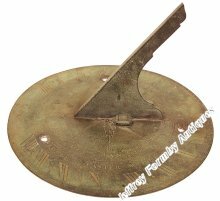 The clock has a 6¼-inch square silvered dial with engraved corners and blued steel hands. Case size 9½ x 6¼ x 12½ high. A George III, 8 inches diameter, bronze horizontal sundial engraved with the maker's name T Blunt Cornhill, London. The centre of the dial is engraved with an 8-point compass rose and the Latin motto Tempus Ager meus (time is my field). 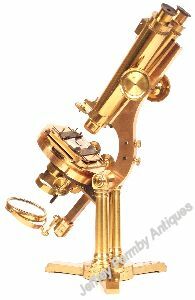 A good Victorian lacquered brass compound achromatic microscope, complete with its original case and accessories, signed and numbered on the foot R & J Beck 31 Cornhill London 6163. The instrument and its accessories retain much of their original lacquer. 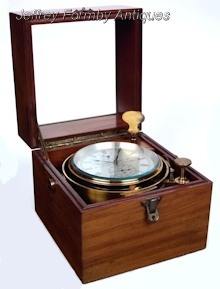 A good 8-day marine chronometer in a 3-tier rosewood box, signed on the silvered dial D. McGregor & Co Makers to the Admiralty, Glasgow, Liverpool, London. No 7357 Gold Medal Paris 1867 Prize Medals London.1862 Paris.1855. The chronometer is complete with its original winding key and a rating certificate dated May 1981. The chronometer was in government service for a period as the Admiralty broad arrow is engraved on the dial and repeated on the bottom of the bowl together with H.S.1. 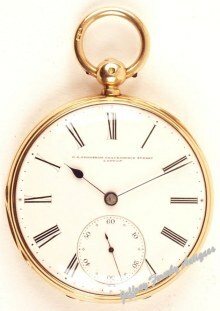 A gold cased pocket chronometer signed on the white enamel dial G. E. Frodsham Gracechurch Street London. The watch is complete with a gold and steel winding key (key not hallmarked). A good Welsh 8-day oak longcase clock, with starburst inlay to the door, signed on the silvered chapter ring John Owen, Llanrwst. The clock is 7' high. 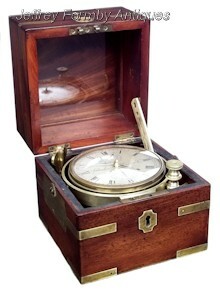 A good 2-day marine chronometer by Victor Kullberg, housed in its original 3-tier mahogany box, and signed on the silvered 4-inch diameter dial Victor Kullberg, Maker to the Admiralty, the Indian and Italian Governments. 105 Liverpool Rd London N. 8205. 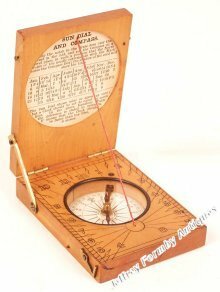 Kullberg's entered this chronometer in the 1912 Greenwich trials where it came 7th and was purchased by the Admiralty on 1 April 1912 for £48.00. The chronometer remained in Government service until it was sold by the Ministry of Defence on 18 October 1983. 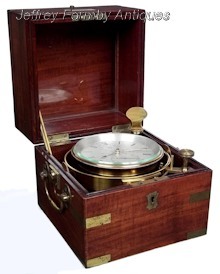 An 8-day barograph in an oak case with a chart drawer below. 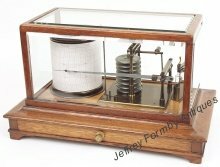 The barograph is engraved for the retailer C. W. Dixey & Son Opticians to the King 3 New Bond St London W.
The barograph is complete with glass ink bottle and dipper, and a year's supply of charts. 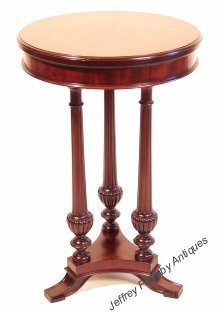 A Victorian mahogany and mahogany veneered occasional table, the top supported on three turned and fluted columns with gadrooned bulbous section, all standing on a triangular base with carved feet. The underside of the table has an applied label: John Manuel & Son, Manufacturers, Devonshire Cabinet Works, Upholstery, Carpet, Brass & Iron Bedstead warehouse, Sheffield.